George Clooney will direct a film about the News International phone hacking scandal. The script will be an adaptation of Nick Davies' book Hack Attack: The Inside Story of How the Truth Caught Up With Rupert Murdoch. The scandal shut down News of the World in 2011 after 168 years in print. It also brought us that display of straight up ride or die realness from Wendi Deng Murdoch when she leapt over several people to block her husband from a pie attack. The Hollywood Reporter notes that George Clooney, the son of a journalist, kind of has a thing for telling the stories of journalists and real life events. 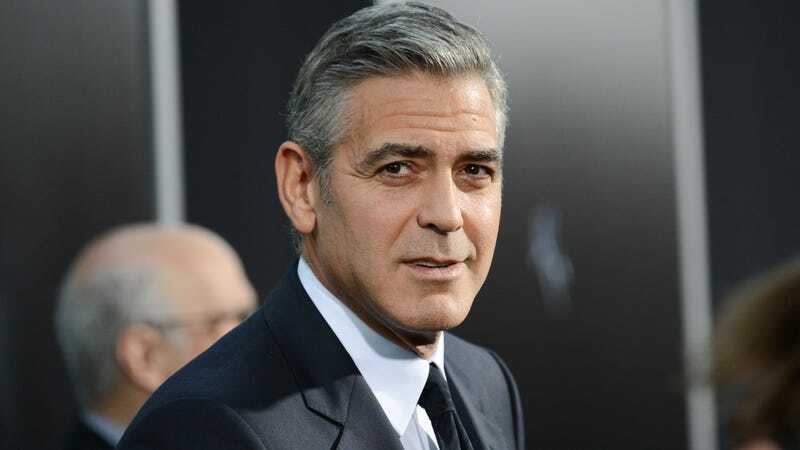 "This has all the elements — lying, corruption, blackmail — at the highest levels of government by the biggest newspaper in London," said Clooney in a statement. "And the fact that it's true is the best part. Nick is a brave and stubborn reporter and we consider it an honor to put his book to film." I would like to preemptively give the Oscar to the person in charge of crafting all wigs for the actor tasked with playing Rebekah Brooks and I would also like to stress the importance including the Wendi Deng Murdoch pie-deflection onscreen. But really, it's just good to see that George is going to keep himself busy after all that arduous wedding planning.